Home / Le blog / Coulon, boat and holy water sprinkler! Coulon, boat and holy water sprinkler! In this week of August 15th, feast day of the Assumption, I dedicate this article to the religious heritage and more exactly to the church the Holy Trinity of Coulon which deserves a hook! A charming "thickset" church and "a farmer"
The capital of Green Venice coils everything against its heart a charming "thickset" church and "a farmer" built in 830, maybe wooden originally, on a platform made up of sand and gravels, between Sèvre Niortaise and Dive, in a meter over the water. It is placed under Saint rescuer's word by the abbot of Charroux (Vienne). 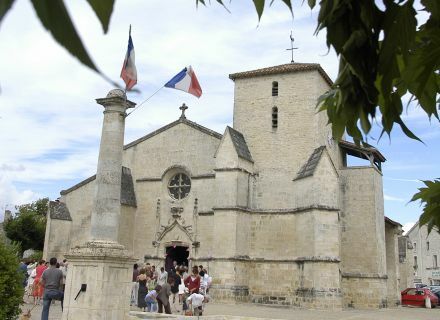 Often plundered by the Normans, it is reconstructed in the XIè s. Between 1154 and 1211, the sanctuary is connected with the abbey of Nieul-s.-l'Autise (Vendée) and is dedicated to the Holy Trinity. The church is partially reconstructed in the XVè s (south nave and side door). In the XIXè s, the architect niortais Pierre-Théophile Segrétain begins works in a "composite style from Poitou": novel for the sanctuary in the flat and Gothic bedhead for the triple nave in the taste of collateral south dating the XVè s. The building is classified in 1992 “Monument historique”. The outside prêchoir: a pure journalistic invention! 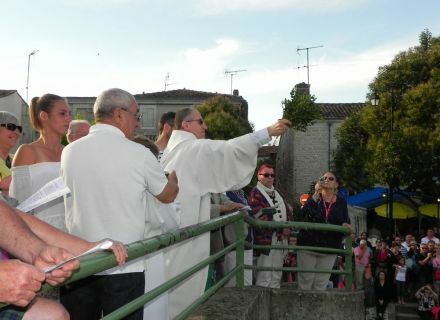 In the ancient times, an outside oratory is raised to allow Maraîchins to attend the office without coming down from boat, when the village was cut by canals. In fact, it is about a pure journalistic invention hawked at the time of the opening of the tourist information office in 1950. The pen name - prêchoir is simply a tower with replacing canopy a removable scale which was hung on on the building to be able to sound the alarm bell without penetrating into the church. Impractical and risking to cause accidents, it is substituted by the tower of staircase the top of which was, before 1733, accessible by a scale, because 13 steps were missing! 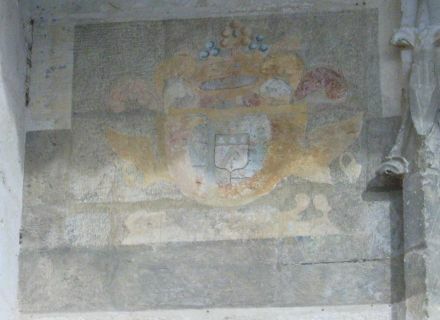 This black band is painted in the XVIIIè s, under the ballet, during the death of Marie-Charlotte of Belleville, mother of the Lord of Coulon, Jean-Gabriel Simon Berthelin de Montbrun. Until 1776, the Lords tops-upholders of the law had the right to be interred in churches. Funeral liter reminds this law of mourning. She represents the coat of arms of several related families: of Belleville, Rochebrochard, Lusignan de Saint-Gelais, Berthelin and Breuil. 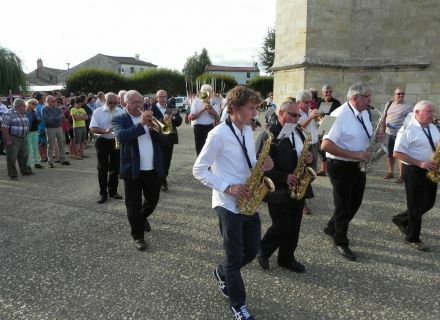 The Holy Trinity of Coulon is a church always alive which, on Sunday, August 23rd, at 7 pm, will vibrate with the blessing of the boatmen of the swamp. 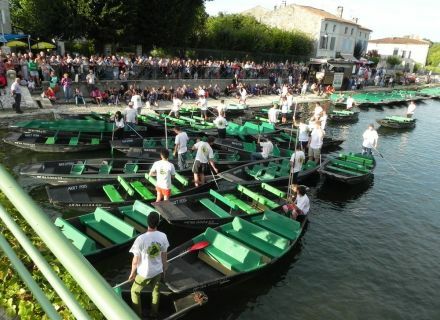 This collective communion, more festive than nun, will be the singular opportunity to highlight the tourist canal transport, the symbolic activity of Green Venice. 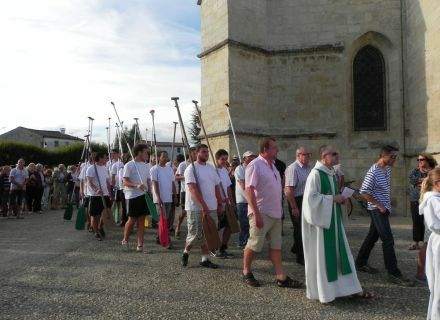 The procession, dressed in white and raised ream, will move off of the church until Sèvre it where a flotilla of boats will form then to be blessed by Father Barratange, successor of this ceremony introduced by abbot Chataigner more than 10 years ago already. Come in large numbers to attend this local tradition which excites hearts and souls!